Allow me to start this post by saying that I am not an expert on this topic and have no special insight into the heritage of this model. That said, what follows is the culmination of much careful research. Given the lack of a good knowledge base on this topic, I have had to make inferences and educated deductions where necessary. I present you my thoughts and ask you to draw your own conclusions. The M481 is a little understood model, likely owing to its relative scarcity. Just how many were produced over its run is unclear. The model was initially released by Pelikan in 1983, largely for the export market, and it appears to have enjoyed only a relatively short production run. Released just one year after the re-introduction of the M400, it seems safe to say that it can be considered the predecessor/prototype of the M200. One of the confounding factors surrounding this model is the fact that the early, pre-1997, M150’s were released with labeling/packaging that stated ‘M150/481.’ In actuality, it appears that the M481 was already being phased out at the time of introduction of the M150 and M200 (1985). 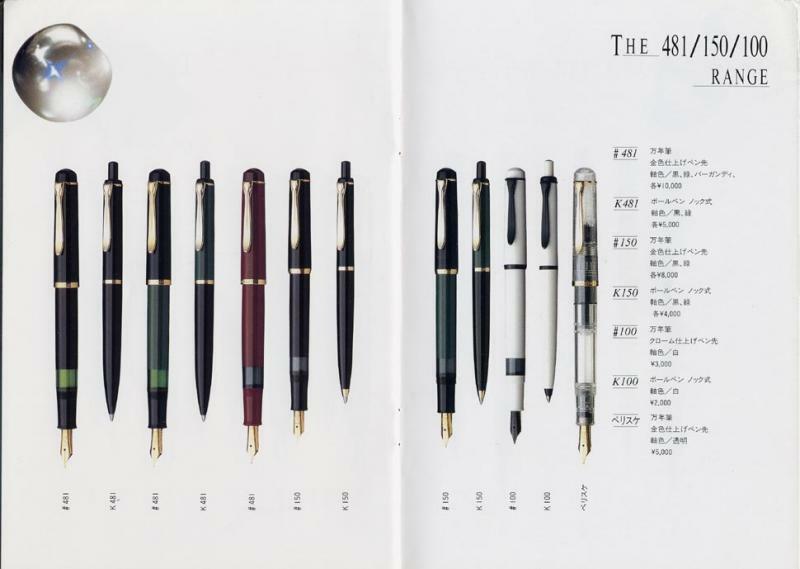 It is my understanding that the 481 designation was an early name for the M150 but when the success of the, then newly released, M400 became apparent, Pelikan decided to build a range of pens around that line. In order to avoid signficant confusion, the 481 nomenclature was dropped and we were left with the M150 as we know it today. Despite the confusion with the model numbers, the M150/481 and M481 are very different pens with distinct features. 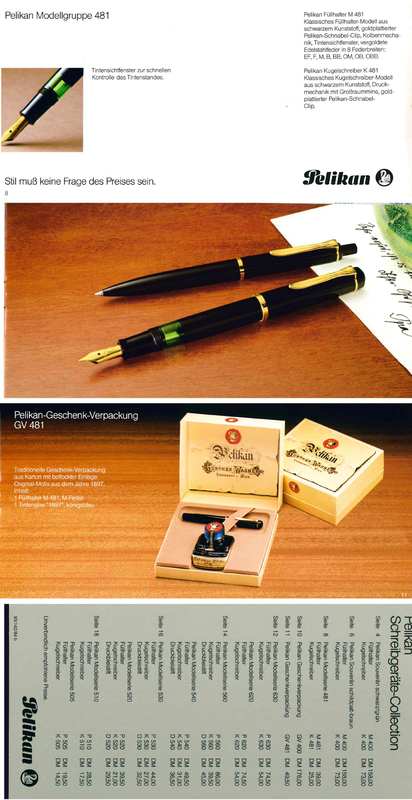 Depicted below is an example of each, shown with Pelikan’s original retail tags. Hopefully, by this point, I’ve convinced you that the M150/481 and M481 were sold as two separate entities, separated by time and likely not in active production concurrently. At quick glance, the green models can appear very similar but the two pens clearly have distinct differences when examined side by side. 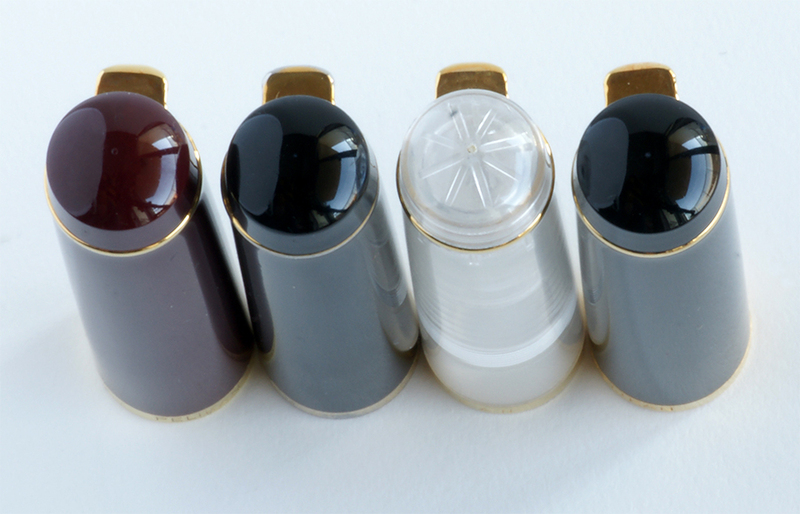 The defining characteristics between the M150/481 and M481 are the ink window, cap band, cap top, and overall size. With the M150/481 versus M481 controversy explained, we can now focus on the M481 as the precursor of the M200. The M481 was predominantly an export model, likely for the Japanese and perhaps Middle Eastern markets. It is the same size as what we know today as the M200 but has several differences in trim detail. The introduction of the M481 preceded the M200 by two years and it appears to have been discontinued when the M200 was introduced (production dates of 1983-1985). The M481 has a derby cap top that has no logo design (it is a smooth cap top), gold trim, absent trim ring on the barrel, and a single cap band. 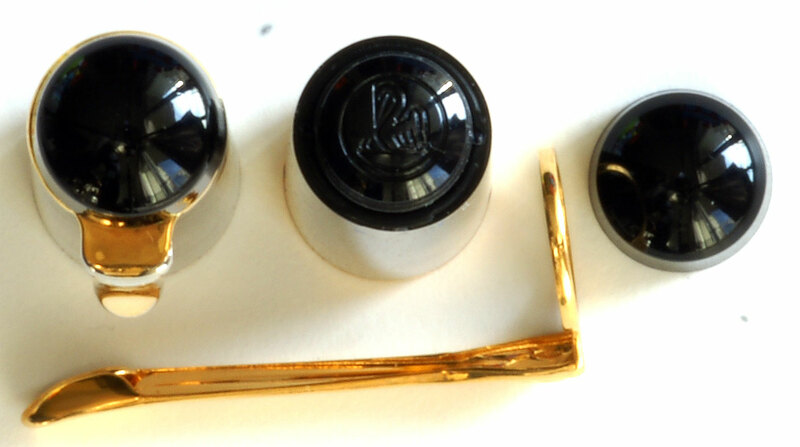 The cap band is inscribed as either “Pelikan Germany” or “Pelikan W.-Germany.” Interestingly, if you unscrew the derby cap top, you will find a two chick Pelikan logo etched beneath (see below). In contrast, the pre-1997 M200 had a derby cap top, gold trim, absent trim ring on the barrel, and two cap bands. The M481 is known to have been available in black, green-black, burgundy, and clear demonstrator color variations. The clear demonstrator was not labeled as an M481 but rather listed as “Pelikan Demonstrator.” Though it does not officially carry the name, it has the same trim as the other pens in the line. Many of the examples that I have come across have employed the experimental and short lived friction fit feed which Pelikan was also known to reintroduce for a very brief time on the M400 of 1982. The nibs on these pens are gold-plated stainless steel, like the M200 that followed. Available nib sizes were EF, F, M, B, BB, OM, OB, and OBB. Below is a scan from a Pelikan brochure depicting the M481, interestingly alongside the M150 and M100, which likely dates the brochure to 1987 with a brief period of overlap between the two models. The black and green-black variants of the M481 are seen for sale at auction from time to time with the clear demonstrator coming up less often. The burgundy variant is exceedingly rare. If you have any additional info on this topic, please feel free to share or correct me where I may be mistaken. As always, I’m open to any and all comments/discussion. Ink window for a fast check of the remaining ink level (picture caption). Pelikan fountain pen M 481. Classic fountain pen model with black plastic, gold-plated pelican beak clip, plunger mechanism, ink window, gilded stainless steel nib in 8 nib widths: EF, F, M, B, BB, OM, OB, OBB. Pelikan ballpoint pen K 481. 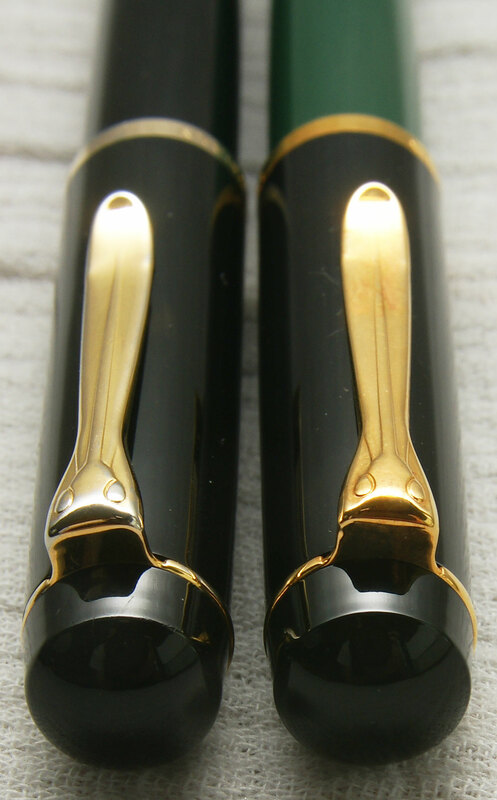 Classic pen model with black plastic push-button mechanism with cartridge refill, gold-plated pelican beak clip. Style need not be a question of price. Traditional gift packaging made of cardboard with flocked liner. Original design from 1897. Content: 1 fountain pen M 481, M-nib. 1 bottle of ink “1897”, royal blue. My black M481 has the screw in nib collar and not the friction fit nib collar. In fact I am using a M400 (1982) screw in gold nib unit in my black M481 pen. That’s a nice combo of nib & pen. Enjoy it! As you wrote that many of the M481 examples that you have seen came with the friction fit feed, I just wanted to share with you that mine has the screw in nib-feed unit. In fact I bought the pen so that I can use my spare M400 screw in gold nib unit in it. Mine is a a very clean or rather NOS example that I bought for what I consider very good price. Only Pak Rupee 2500.00 ($23.50 approx). A superb article. Many thanks! An excellent methodical and reasoned review on a generally poorly documented subject.